A hapless young Viking who aspires to hunt dragons becomes the unlikely friend of a young dragon himself. 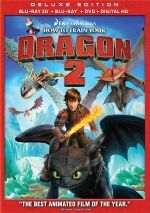 With 2010’s How to Train Your Dragon, we get an animated Viking adventure packed with fantasy elements. Set in the fictional town of Berk, we learn that Vikings and dragons have battled for many years. Teenaged Hiccup (voiced by Jay Baruchel) wants to live up to the legend of his powerful father Stoick (Gerard Butler). However, his dad protects the scrawny youngster and won’t let him join in the battles against the winged invaders. Eventually Stoick’s buddy Gobber (Craig Ferguson) convinces him to allow Hiccup to enter dragon-training classes. This should be a banner day for the brainy, accident-prone youngster, but a major event intervenes when Hiccup rescues a wounded dragon. He names the creature “Toothless” and uses his inventing skills to repair the dragon’s busted tail. Together they bond and set Hiccup on a crusade to convince the other Vikings that they can find a way to get along with the dragons. When I saw Dragon theatrically in 2010, I thought it seemed… pretty good. The film touched the bases I expected from an effort of this sort, as it delivered a mix of laughs, action and emotion and became a perfectly enjoyable little tale. I just didn’t think it rose above that level, which made all the plaudits that flew its way surprising to me. It enjoys a 98 percent “fresh” rating on Rotten Tomatoes - 98 percent! Granted, the RT system comes with flaws, as all of those positive ratings could offer mild praise, not raves. Tons of good reviews doesn’t necessarily mean tons of enthusiastic, great reviews. Truth to tell, if my thoughts got included, they’d fall into the “fresh” category as well, for I do enjoy Dragon. As I noted, I think it delivers a likable adventure, as it gives us enough meat to keep us engaged. I just find it hard to view the film as something obviously above average or superior to many other animated flicks. On the surface, Dragon seems to have a lot going for it, as it comes with solid dramatic potential and colorful characters, all of which should combine into a top-notch effort. To me, though, the end result remains no better than pretty good. The action entertains but never quite thrills. The jokes amuse but don’t deliver big laughs. The characters appear likable and engaging but not especially memorable. The emotional narrative gives us a decent arc but fails to truly move us. Which brings me back where I started: a feeling that Dragon gives us something… pretty good. I recognize it’s better than just “okay”, as that term connotes a more obvious level of mediocrity. While Dragon may not thrill me, it rises above that range and scores a solid 7 out of 10. Perhaps the “Sequel Test” offers the clearest indication of my feelings. As I write this, Dragon 3 hits screens in two days. Will I see it? Yup. Will I do so with any enthusiasm? Not really, as I can’t claim I truly look forward to it. So I remain of the opinion that Dragon works but it lacks that something special to allow it to become a classic. The animation looks good, the actors perform their parts well, and the tale moves at an appropriate rate. All the ingredients exist, but they don’t quite come together well enough to allow the movie to soar. How to Train Your Dragon appears in an aspect ratio of approximately 2.35:1 on this Blu-Ray Disc. This became an excellent visual presentation. No issues with sharpness occurred, as the movie offered crisp and detailed images from start to finish. If any softness marred the presentation, I couldn’t find it. Jagged edges and shimmering remained absent, and no edge enhancement appeared. I also found no source flaws. Dragon went with a fairly earthy palette. It favored greens and ambers, with a somewhat subdued feel. The hues seemed well-developed at all times. Blacks came across as deep and rich, while shadows presented good clarity and visibility. This was a very satisfying transfer. I also felt pleased with the Dolby TrueHD 5.1 soundtrack of Dragon. With a variety of dragons and all sorts of action sequences, the movie boasted many opportunities to feature all five speakers, and it did so quite well. Various effects zoomed around the room to create a fine sense of immersion. Throughout the film, the components meshed together smoothly and transitioned well. Localization was clean and precise, and the score featured solid stereo imaging. The mix turned into a broad, encompassing piece. Music seemed warm and full, while effects added a real bang to the proceedings. Those elements showed good clarity and accuracy, and they offered tight, deep bass as well. The track seemed vibrant and dynamic as it accentuated the movie. This package includes both 2D and 3D versions of the film. The picture comments above reflect the 2D edition – how does the 3D compare? Visuals seem virtually identical. A few nighttime scenes may be a smidgen darker on the 3D, but any differences feel insignificant, as this version looks excellent. In addition, the movie’s stereo imagery dazzles. Sometimes when I watch a 3D movie, it comes with such mild stereo presence that I forget it’s 3D, but that’s never a concern here. Instead, the Blu-ray offers consistently broad and engaging stereo material. These factors make the movie much more immersive and vivid, as the visuals open up and swallow the viewer. With all those dragons, we get lots of flying scenes, and those offer very good movement and involvement. A few underwater shots actually fare best, though. Whatever the setting, the 3D Dragon excels. It becomes a fine presentation to show off your TV’s 3D capabilities. On the Blu-ray, only one extra appears: a 3D trailer for Puss In Boots. However, an included DVD copy brings a few components. There we locate an audio commentary from writers/directors Chris Sanders and Dean DeBlois and producer Bonnie Arnold. All three sit together for a running, screen-specific look at story/character areas, visual design, animation, cast and performances, music and editing, and a few related topics. Though it sags at times, the commentary usually offers a good look at the film. It starts slowly but becomes pretty informative before long. From there the track continues to be largely engaging as it tells us a nice mix of details about the production. Two featurettes follow. Viking-Sized Cast goes for 11 minutes, 44 seconds and provides into from DeBlois, Sanders, Arnold, and actors Jay Baruchel, Gerard Butler, Craig Ferguson, Christopher Mintz-Plasse, America Ferrera, Jonah Hill, Kristen Wiig, and TJ Miller. This one covers cast, characters and performances. We don’t get many insights here, but I like the shots of the actors in the studio. The Technical Artistry of Dragon lasts 10 minutes, 13 seconds and provides statements from Sanders, DeBlois, Ring, Hordos, DreamWorks Animation Chief Technology Officer Ed Leonard, DreamWorks Animation Head of Digital Operations Derek Chan, Head of Research and Development Lincoln Wallen, and Research and Development Manager Neil Okamoto. “Artistry” looks at effects, dragon design, 3D and other visual elements. The program offers a good overview of some technical areas. If you click Keep Out! from the main menu, you’ll find promos. It brings ads for Megamind, Shrek Forever After, Penguins of Madagascar, Last Airbender, Shrek: The Musical and some videogames. We get no trailer for Dragon. Note that this package loses a slew of extras from the Dragon Blu-ray. DreamWorks consistently pairs 3D BDs with DVDs instead of separate 2D Blu-rays, which stinks for fans who want all available bonus materials. As an animated adventure, How to Train Your Dragon offers a moderately entertaining affair. While it never quite excels, it gives us a likable affair without obvious flaws. The Blu-ray delivers excellent picture and audio along with a small but informative set of supplements. 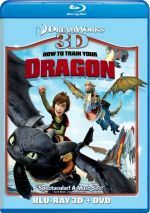 I don’t love Dragon, but I think it usually works well, and the 3D Blu-ray becomes the most fun way to watch the flick.